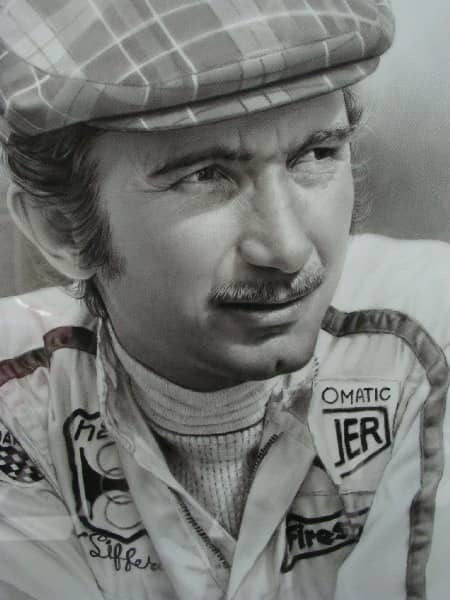 Jo “Seppi” Siffert was born in Fribourg, Switzerland. He initially made his name in racing on two wheels, powering his way to the Swiss 350 cc motorcycle championship in 1959, before switching to four wheels with a Formula Junior Stanguellini. Jo Siffert financed his racing career by dealing in scrap metal and secondhand cars. He graduated to Formula One as a privateer in 1962, with a four-cylinder Lotus-Climax in the Belgian GP. In 1963, he moved to the Swiss team Scuderia Filipinetti, but disagreements with the team management made him to leave the team before the end of the season. He bought a Brabham-BRM and completed the season as a privateer. Early successes included victories in the non-Championship 1964 and 1965 Mediterranean Grands Prix, both times beating Jim Clark by a very narrow margin. With these successes in Germany and Sicily, Rob Walker teamed Joakim Bonnier with the Swiss driver. First race was the Grand Prix in the USA. Jo Siffert paid Rob Walker’s confidence in cash, as he achieved his first podium finish in this race, behing Graham Hill and John Surtees. The years 1966 and 1967 marked Siffert’s transition from the world of Formula One to the world of sports car / endurance racing. In 1966, Siffert took a Porsche Carrera 6 to a 4th place finish in the 24 hours of Le Mans, with other top-six finishes at Sebring (12-hours), Monza (1000 km), Austria. Siffert became famous as a leading driver for the factory Porsche effort in its quest for the World Sportscar Championship. Siffert’s driving displays in the Porsche 917 were legendary, earning him several major wins in Europe. For 1967, driving Porsches (with Hans Hermann) and Ferraris, Siffert finished 2nd at Spa (a track which would later be the site of some of his most notable successes), 4th at Sebring and Daytona, 5th at Le Mans and Monza and 6th in the Targa Florio. The 1968 season is well thought of as Siffert’s break-through season, in both Formula One and endurance racing. He had a spectacular win in the British Grand Prix, driving Rob Walker’s privately entered Lotus 49 Cosworth, with 5th and 6th place finishes in the United States and Mexico. It was in sports car racing, however, that he laid claim to the title of the best racer in the world. Siffert drove for the Porsche factory team, and won the 24 hours of Daytona, the 12 hours of Sebring, the Nurburgring 1000 km race, and the Austrian 1000 km race, driving this last event single-handedly. The 1969 season followed a similar pattern, with Siffert having four Formula One finishes in the top five (in South Africa, Monaco, Holland and Germany), but being almost unbeatable in the sports cars. Sharing a works Porsche 908-2 with Brian Redman, Siffert won the BOAC 1000 km, the Monza, Spa and Nurburgring events, as well as a Watkins Glen 6-hour race. Teamed with Kurt Ahrens in a Porsche 917, he also won the Austrian 1000 km race. Joining a third racing series during the season, Siffert drove a Porshce 917 in eight Can-Am events, recording four finishes in the top four positions. For 1970, Siffert joined a much-heralded new Fromula One team, driving for March (with Chris Amon also on the works team). The year started with great promise, as Jackie Stewart finished 3rd in the season opener at Kyalami and won the second race of the season, at Jarama. But as Ferrari and Lotus sorted their cars during the season, the March became less competitive and proved almost a total wash-out for Siffert, as the new car was plagued with mechanical failures. Siffert failed to score a single championship point — recording six finishes in the 7th to 10th range, and failing to qualify or finish in an additional seven GPs. Once again, Siffert met with far greater success in the world of sports cars. He won the Targa Florio, driving a Porsche 908-3 with Redman, and the Spa 1000 km, also with Redman, and had 2nd or 3rd place finishes at Daytona, Watkins Glen, Jarama and Kyalami, all in Porsches. After the disappointing season with March, Siffert signed to drive for the BRM team in 1971. After disappointing finishes through the first half of the season, Siffert finished 6th in Holland, 4th in France, 9th in the British GP (at Brands Hatch), and then led the Austrian Grand Prix from start to finish to record his second Formula One victory. Ninth place finishes at Monza and Mosport were followed by a 2nd place finish at the United States GP, in Watkins Glen. Where he failed to record a single championship point during the 1970 season, he finished tied for 4th (with Jacky Ickx) in the final standings for 1971. Once again, in 1971 Siffert had remarkable success in the endurance and Can-Am races. He opened the season with a win at Buenos Aires (driving with his new partner, Derek Bell) and finished well at Sebring (5th), Brands Hatch (3rd), Monza (2nd), Spa (2nd), Nurburgring (2nd), Vallelunga (2nd) and Watkins Glen (2nd). Across the Atlantic, racing in the Can-Am series, Siffert entered seven races in the Porsche 917-10 and had finishes ranging from 2nd to 5th in each of these races. After a 5th place finish in the Can-Am race at Leguna Seca, his season should have been finished. Just as the 1970 Formula One season ended in tragedy, with Jochen Rindt winning the World Championship posthoumously, the 1971 season finished with the tragedy of Jo Siffert’s death in its final race. Earlier in the season, the Mexican Grand Prix had been cancelled, because of safety concerns at the track. As a substitute for the Mexican GP, a non-championship Formula One races was held at Brands Hatch, on October 24, 1971. It was expected that the Brands Hatch race (called the “Rothmans World Championship Victory Race”) would be a celebration of a great season, in which British hero Jackie Stewart had dominated the point standings. Stewart won six of 11 races, with his 62 championship points almost doubling the 33 points of Ronnie Peterson. Celebration turned to tragedy on the 15th lap, when Sifferts’s BRM P160 went off the track at Hawthorn Hill, the fastest section of the circuit. The precise cause of the accident has never baan made poublic, but the car hit an earth bank and erupted into flames. Siffert died of asphyxia in the cockpit, having suffered only a broken leg as a result of the impact. Siffert was married twice and to his second wife Simone during the height of his career in the late 1960s and at the time of his death in 1971. They had two children together, Véronique and Philippe who regularly can be seen in the international automotive scene at several events.